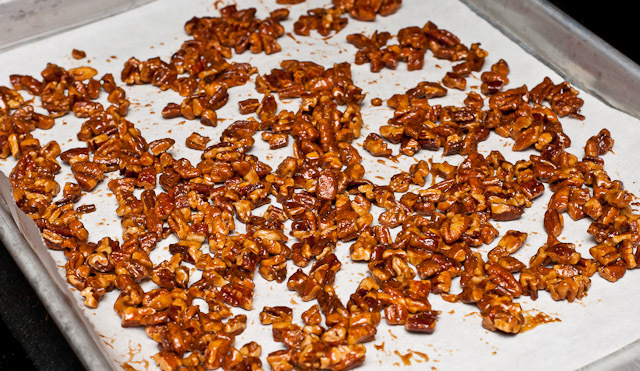 Pralines are nuts in candy form and this recipe makes crunchy toasted honey pralines that are excellent for topping desserts or blending into ice cream. 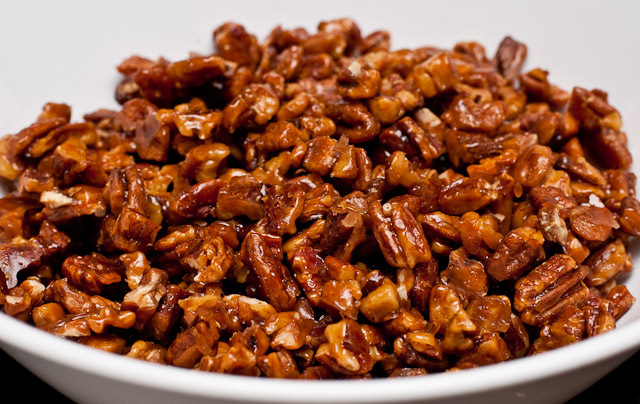 This recipe only takes a few minutes to make and can be easily modified to use your favorite nuts. I adapted this recipe from Jeni's Splendid Ice Creams at Home. 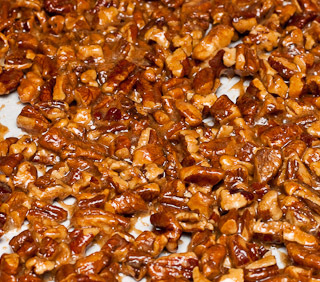 I found her recipe resulted in pralines that were more like candy with nuts than candied nuts, so I increased the quantity of chopped nuts to 1-1/2 cup (from 1 cup). If you'd like more candy than nuts, then just reduce the nuts to 1 cup. Preheat oven to 350°F (175°C) and set a rack in the middle position. The ingredients you'll need are 2 tablespoons (42 g) honey, 2 tablespoons (28 g) light brown sugar, 1-1/2 cups (170 g) chopped pecans, 1 tablespoon (14 g) melted butter, and 1/4 teaspoon (1.5 g) table salt (not shown in photograph). Stir the ingredients until well coated. Place a sheet of parchment paper on a half sheet pan. 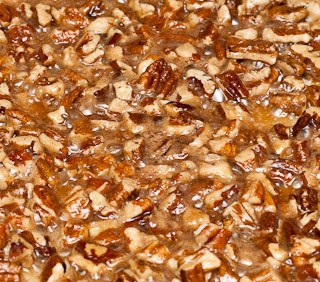 (Aluminum foil also works, but don't use wax paper - the wax will melt and become part of the pralines. The result will still be edible, but not desirable.) 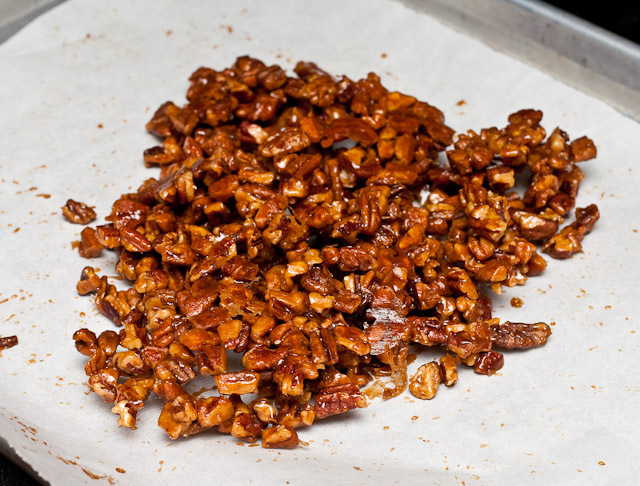 Scoop the sugar, honey, and nuts mixture onto the parchment paper and spread out into a single layer. Place the sheet pan into the preheated oven and let it bake for 8 minutes. After the eight minutes have elapsed, remove the sheet pan. 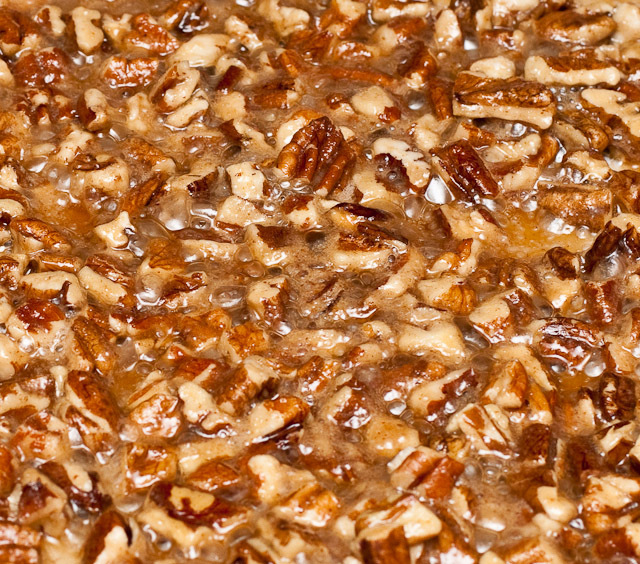 The sugar and honey mixture should be melted and bubbling forming a giant puddle of hot, sticky pecan and caramel. Using a heat resistant spatula, stir the candied nuts to evenly coat the nuts in the hot sugar syrup and spread it out again. Put the pan back in the oven for three more minutes, then stir it again. Place the pan back in the oven. After another three minutes, remove the pan. 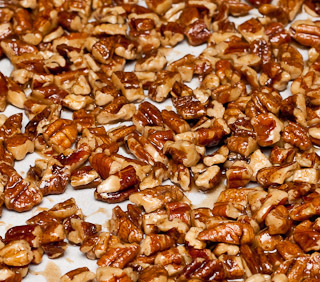 The pralines will have taken on a darker, richer color and will smell of candy and toasted nuts. 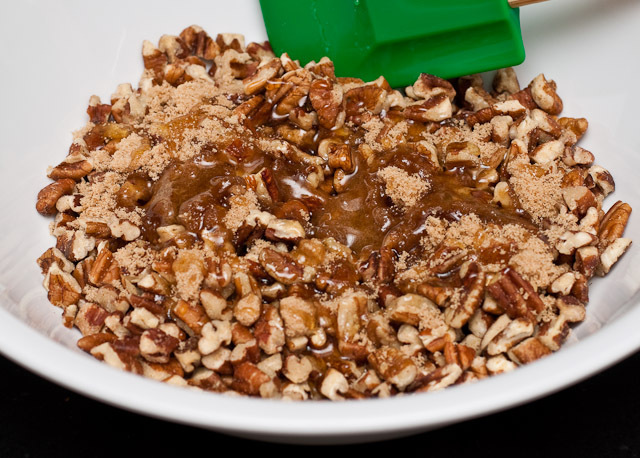 Using your heat resistant spatula, spread the nuts out as much as possible and allow it to cool completely. 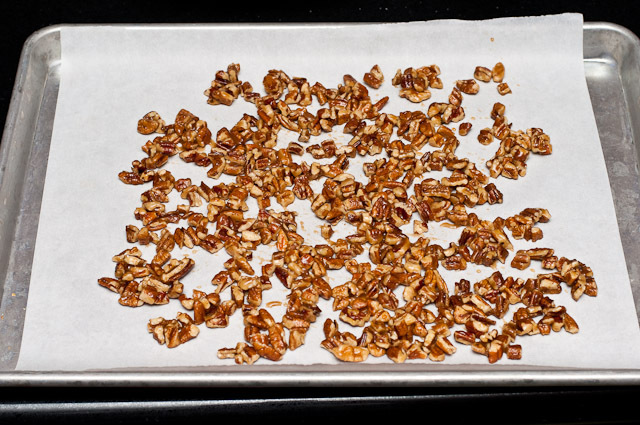 Once the pralines are cooled, pull the parchment paper together to form the pralines into a mound and to break up the larger chunks. 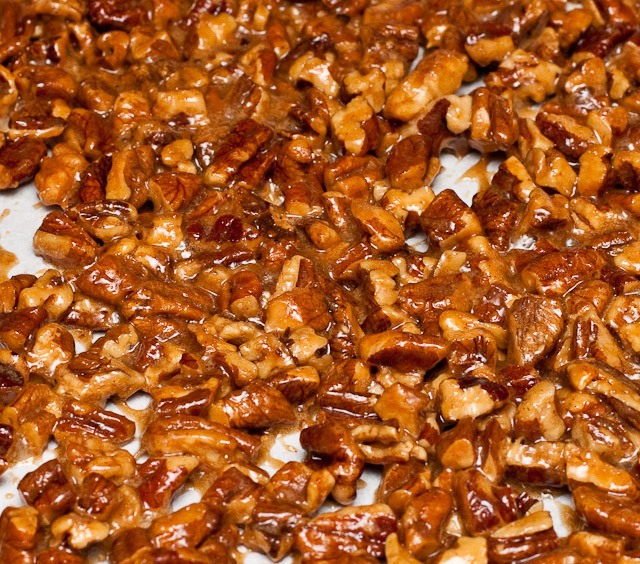 Then break the individual pieces of pralines into smaller pieces. You can use a tool for this like a spoon or knife, but I find it easiest (and cleanest) to just use my hands. 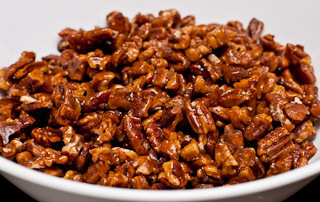 Pralines are best eaten immediately or blended into just made ice cream, but can be kept without much deterioration by freezing them in an airtight container. 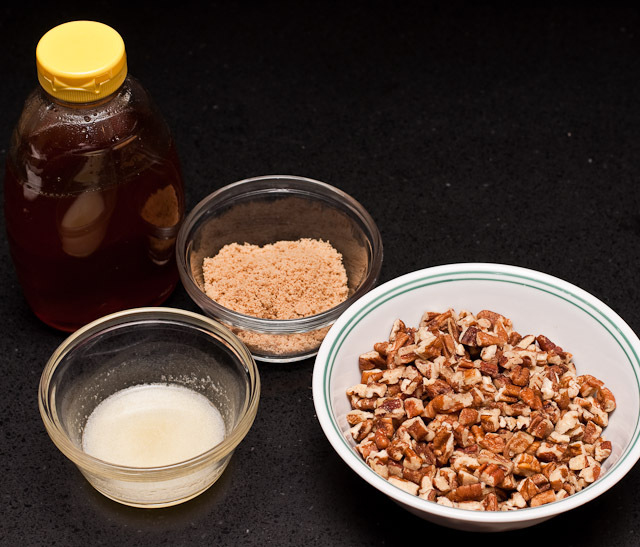 Leaving them out will allow the sugar mixture to absorb water and become soft and sticky again. I miss seeing your blog, I love your methodical ways and will be making these perhaps today, and saving some for pumpkin pancakes, then will get out that ice cream sleeve that has been residing in my freezer for 2 years and never used to make the ice cream, thank you so much Michael. 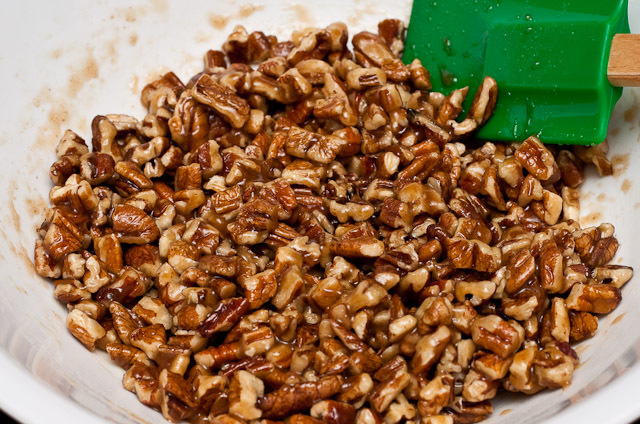 wonderful method for candied pecans. I always end up with chunks of candy rather than separate nuts. 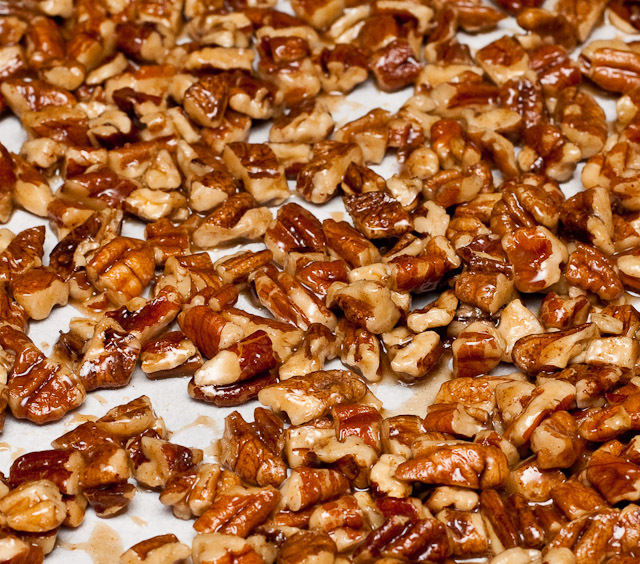 Delicious, easy, making second batch right now. Very well done! Your directions and accompanied photographs made this recipe easy to follow and to understand. I will look for more of your recipes in the future. The praline turned out just like I was looking for! thank you!